Tucked deep in the British Columbia backcountry, Siwash Lake Wilderness Resort is a boutique-style guest ranch run by husband and wife Roy Grinder and Allyson Rogers and their fabulous team. It’s the ideal spot for families to get away from it all yet still be pampered in the middle of the wilderness. Surrounded by wide-open skies, rolling grasslands and forests dotted with lakes, the setting is as stunning as it is serene. With no cell service and limited WIFI in the lodge only, families can really disconnect and spend quality time together. Siwash Lake’s pasture-to-plate cuisine, expert guides, wide array of activities, friendly staff, hands-on owners and spectacular scenery are what make this such a special place, where guests are sure to leave wanting more. The accommodations are incredible: safari-inspired tents, lodge rooms and the unique Cariboo Suite in the loft of an onsite log barn. The tents include two bedrooms, radiant-heat floors, private bathroom facilities and private decks with stunning views of the lake. Perfect for families, they offer a great deal of privacy yet are close to the main lodge. Want help booking a stay at Siwash Lake or planning a Canada trip with kids? We stayed in the Cariboo Suite, rustic and cozy with luxurious linens and the most comfortable bed— a perfect combination of authenticity and refinement. Freshly baked muffins and carafes of coffee and hot chocolate were delivered to our doorstep every morning as a pre-breakfast treat. The horses roam free at night, and every morning they run back to the barn to get ready for the morning ride. My girls loved the morning ritual of sitting on the balcony of our cabin and watching the horses gallop in, neighing with excitement. As Siwash Lake is so far off the beaten path and has an eco-friendly solar power supply, the staff provision and set menus in advance according to what’s available, seasonal and fresh. They try to be as self-sustainable as possible and are happy to accommodate any dietary restrictions. Our meals were incredible across the board. One evening I asked our server if I could have a green salad, and I soon looked out the window to see her in the greenhouse, then walking across the yard to the lodge with a handful of lettuce. Two minutes later my salad was in front of me. It doesn’t get any fresher than that! Breakfast, lunch and dinner are served in the main lodge, and guests are assigned a table for their stay. Everyone gathers for the daily happy hour on the deck overlooking the lake (if the weather doesn’t cooperate, it’s held in the lodge by the beautiful stone fireplace). This is a great time to recount the day’s activities with fellow guests — Siwash Lake is the type of place where you’ll leave with everyone’s email address and promises to keep in touch. Since our stay, Siwash Lake also has opened the Ridge Pavilion, the new hub of the resort, for elegant outdoor dining and lounging amid nature. It is obvious that Allyson is passionate about horses; the equine program is fantastic. A great deal of thought is put into pairing horses with guests to match both skill level and personality. You’re assigned the same horse for the entire stay, which allows for true bonding. By the end of my stay, my horse would come when I called his name, a highlight for me. The whole approach to the equestrian program at Siwash Lake is different than any other I have experienced. There is an emphasis on education and safety: All guests have an orientation the first day where they learn to tack their horse, including cleaning their hooves. This allows riders a chance to develop trust with their equine companions. Trail rides aren’t the typical nose-to-tail style — exploring the old-growth forests and rolling grasslands with the Marble Mountains in the background is unforgettable. For those less interested in riding, there are plenty of other exciting options, including archery. We liked that archery here is so much more than standing in one spot shooting arrows into a target on a hay bale. Instead, we had a fun family contest with our guides on a trail through the forest, shooting at fake animals. Fishing, hiking (guided or not) and all kinds of water sports, from water skiing to canoeing and paddle boarding, are among the many activities included. Our favorites were marksmanship and the unusual sport of hatchet throwing. My city kids had never even seen a gun, let alone shot one, so this was quite an experience for them. Alternatively, you can embrace nature with an outdoor yoga class, listening to the birds and the wind in the aspen trees, or just relax on an Adirondack chair and enjoy the view. And for us, watching the sunlight on the meadow while playing a game of fetch with Roy’s dog Layla was just magical. There are several ways to get to Siwash Lake, all of which are a bit of a journey but so worthwhile. We took the scenic route on the famous Skyline Drive from Vancouver through the desert, and the changes in topography during the 4-hour drive were unbelievable. Another option is to fly in via seaplane or drive from Banff and Lake Louise. TIP: If you choose to drive, you’re asked to call and let the staff know you are on your way once you hit the mile marker for 70 Mile House. A little farther from here, you will hit a dirt road and lose cell reception. 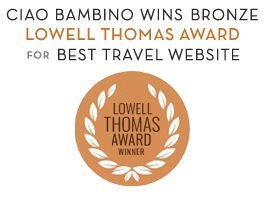 Editor’s Note: Ciao Bambino received a media package to review Siwash Lake Wilderness Resort for families. As always, our opinions are our own. Photos by Sandy Pappas except where noted.